For a region with far less geothermal activity than Yellowstone and a far lower mean temperature than much of the American southwest, the southern Los Padres — the Sespe Wilderness especially — still has its share of infernal placenames. You might have a devil of a time sorting them if not for the handy (partial) breakdown below. 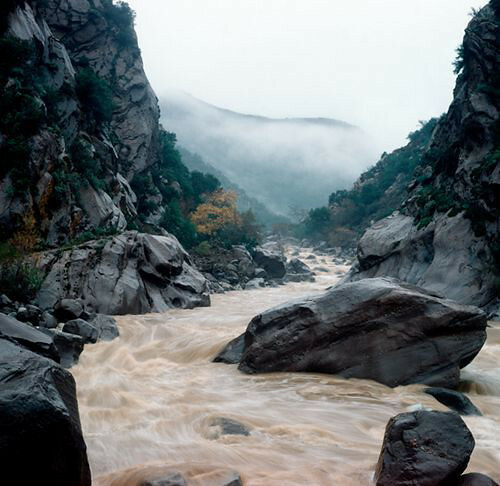 The first major tributary to the Santa Ynez River downstream from the Gibraltar Reservoir, Devils Canyon drains northward from the Santa Ynez Mountains. Named for the bare, heart-shaped sandstone formation on the peak’s south face, Devils Heart Peak is at the center of the Sespe Condor Sanctuary and a point now only (legally) stood upon by researchers and those in the employ of a handful of government agencies. And this is really the area where one hits the mother lode of Satan’s toponomy. The 7.5′ quad that covers this area (Devils Heart Peak, naturalement), is loaded with these. So in a ~22 x 27-inch sheet we’ve got … what, at least half a dozen nods to the underworld? Isn’t it enough San Rafael Peak tops out at 6,666 feet? Often confused with the Devil’s Gateway to the northeast on the same quad, Devil’s Gate is a narrow rock-lined canyon along the Sespe (near the edge of the Forest boundary). 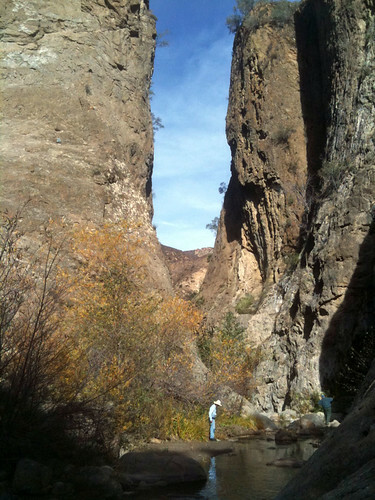 Often confused with the Devil’s Gate to the southwest on the same quad, Devil’s Gateway is a narrow formation along Agua Blanca Creek in the eastern Sespe Wilderness. A grassy flat along the Pothole Trail in the eastern Sespe Wilderness, Devil’s Potrero is the grassy flatlands around the Pothole formation (just up a side drainage from the above-mentioned Gateway). Meanwhile, back outside the Sespe, we’ve got the Devil’s Slide, Diablo Canyon (which reaches Agua Caliente Canyon just upstream from the debris dam), Devil’s Playground … this list goes on and on. Given the summer heat and fairly merciless chaparral, a likening to hell is understandable, but still something of a stretch. But then there’s Hell’s Half-Acre. Who the … um, “hell” … named this, Nanook of the North? The similarly-named spot in Wyoming I get. Something along the San Emigdio badlands, sure. Anything in the Caliente Range I would totally understand. But this? 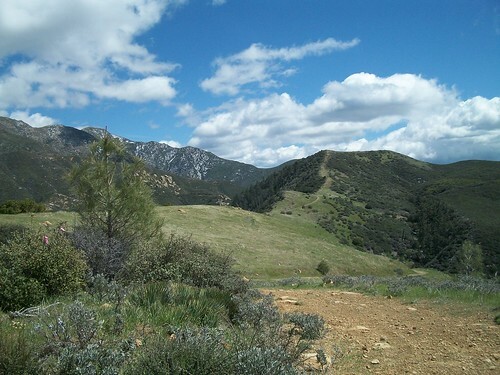 Along the old McKinley Fire Road in the upper Santa Barbara Ranger District, Hell’s Half-Acre provides fantastic views of the Santa Ynez Mountains and the Sierra Madres, and is nowhere nearly as intimidating as it sounds. This is more Julie Andrews-spinning-and-dancing-along-the-ridgeline terrain. Even in the summer — though hot — it’s a pretty sweet spot. In the spring, it’s closer to Valhalla. So this begs the question … what spots out there actually deserve an archfiendish moniker? I always thought Hell’s Half Acre was the stretch of the McKinley Fire Road with the sandstone rock outcroppings. I agree that it is far more beautiful than hellish, but I took it that it felt like hell to those trying to build that road through it! 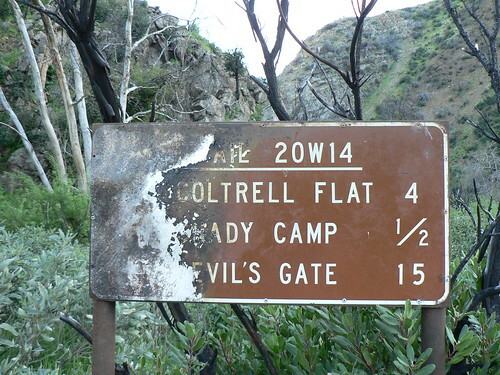 My personal hell trail would have to be the fire road over Hildreth Peak… brutal. Hey Ned, thanks for dropping by. Agreed; it must have been a herculean effort getting that stretch of road … have you seen that fire cut that heads southwest up the ridge from the outcrops? Somebody with some real nerve in that dozer. Not sure when it was cut … I know that stretch burned during the Wellman Fire, but it looks as though it’s been re-cut since. I agree with Ned, I always thought HHA was the rock formation section. I’ve often felt like Don Victor could be seen as hell, for a few different reasons. re: HHA, everything I’ve read indicates the name applies to that entire ridgeline from the western drop to the outcrops. But I’m totally willing to concede it’s just those rocks in the east (makes total sense). I’m putting further clarification on the mysteries-to-solve list, and will report any findings. Perhaps it isn`t the terrain that gives rise to the naming of the areas so much as what inhabits the areas…and the events that occur in them. If you can find out what the Native Americans called these areas, that may have some clues. A lot of places in the U.S. that have the word “devil” in the name are rough translations of the names given those places by the local Natives. 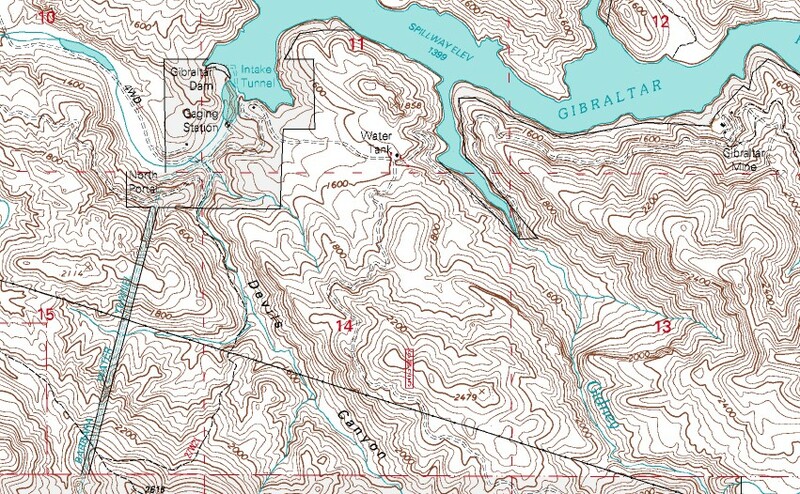 What’s also interesting to me is that there always seems to be a much higher occurance of weirdness coming from places with names like Devil’s Creek or Devil’s Back Ridge or whatever. There are more missing people, more strange sightings of seemingly impossible stuff, and so forth. Maybe the Natives knew what they were doing when they named these places…?